What is different about hypoxia on V-A ECMO? A 41 year-old man is supported with peripheral V-A ECMO. He presented 3 days ago with a STEMI, the percutaneous coronary intervention was complicated by pulmonary aspiration requiring intubation. Despite revascularisation he had progressive cardiogenic shock and was placed emergently on V-A ECMO. The circuit is running without any problems but he is now hypoxaemic with an arterial O2 saturation of 82%. Q1. How do you assess this patient at the bedside? As always, assess both “the man and the machine” (the patient and the ECMO support). Where was the oxygen saturation measured from? The oxygen saturation is routinely measured on the right arm in femoral V-A ECMO (alternatively the right ear lobe or forehead). If abnormal, the opposite site should be checked for comparison. A pre-oxygenator SaO2 can be used to exclude high oxygen extraction. Is there pulmonary dysfunction? Are there clinical findings of pulmonary oedema (LV failure) or other lung disease? This patient has a femoro-femoral peripheral V-A ECMO configuration with unchanged circuit blood flow of 3.8L/min over the last day. The oxygen saturation on the right arm has fallen to 82% and measures 99% on the left hand. 100% oxygen is connected at a fresh gas flow of 5 L/min. There is now good pulsatility on the arterial trace. Ventilator settings are appropriate. Pre-oxygenator SaO2 is 75%, excluding excess oxygen extraction as a cause of hypoxaemia. Q2. What is the likely diagnosis? Differential hypoxia in this situation is expected due to the recovery of native cardiac function in the setting of aspiration causing respiratory failure. You review the patient’s most recent chest x-ray and find persistent bilateral infiltrates consistent with aspiration pneumonia. Q3. What is the underlying pathophysiology? Patients on V-A ECMO have retrograde blood flow in the aorta, as blood moves up the aorta toward the heart from the ECMO circuit. When there is intrinsic cardiac activity there is also anterograde blood flow entering the aorta from the heart. The transition point where opposing flows meet in the aorta will vary and depend on the relative magnitude of the ECMO blood flow and the patient’s cardiac output, but may be as low as the mid aorta. In the presence of pulmonary disease, the blood leaving the heart may be poorly oxygenated due to impaired gas exchange in the lungs. We monitor SpO2 on the right upper limb as an early indicator that the transition point is moving distally because the right subclavian artery arises from the brachiocephalic artery, which is a proximal branch of the aorta. 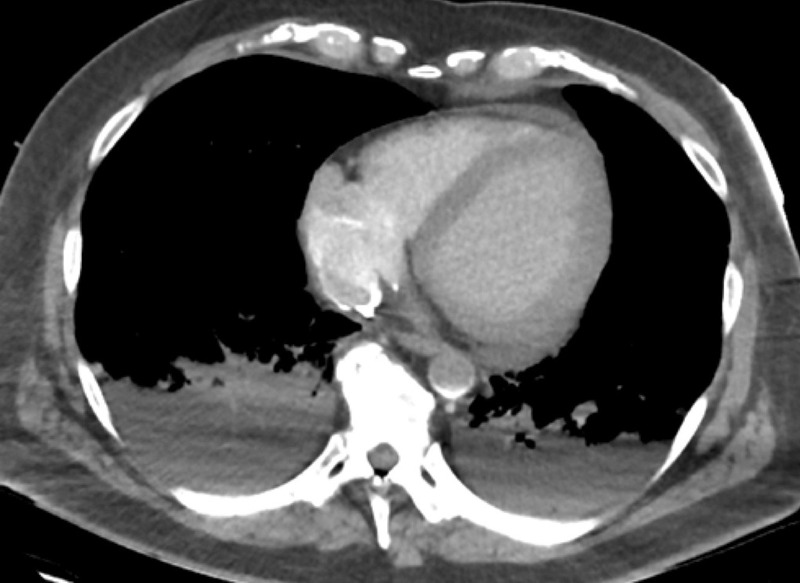 The transition point can also be visualised by contrast CT. The contrast rich blood returned via the femoral artery can be seen at the transition point in the aorta (sickle shape contrast in aorta) as a result of to retrograde flow from the ECMO return cannula. Q4. What are the two major clinical concerns? When there is differential hypoxaemia poorly oxygenated blood is ejected from the left ventricle and will first enter the coronary circulation with potential for cardiac ischaemia. If the transition point is more distal, poorly oxygenated blood will subsequently enter first the brachiocephalic and then the left carotid arteries, which may cause cerebral ischaemia. Clinicians, paradoxically, should be alert to these potential complications whenever the heart begins to recover and pulsatility improves. Q5. What are the prerequisites for this condition to occur and how do you confirm it? Markedly lower oxygen saturation (SpO2) between the right arm compared to the left arm or between upper and lower limbs (the so-called “North-South phenomenon”). If in doubt this may need ABGs to confirm. Q6. Can this condition occur in central ECMO? No, patients on central V-A ECMO cannot develop differential hypoxia. In central V-A ECMO the return cannula is sutured into the proximal aorta, with predominately anterograde blood flow down the aorta. There may be a drop in global oxygen saturation with increasing amount of deoxygenated blood ejected from the heart, however, significant differences in oxygen saturation between upper and lower body will not occur. Q7. What is meant by the term ‘dual circulation’ in the context of this condition? 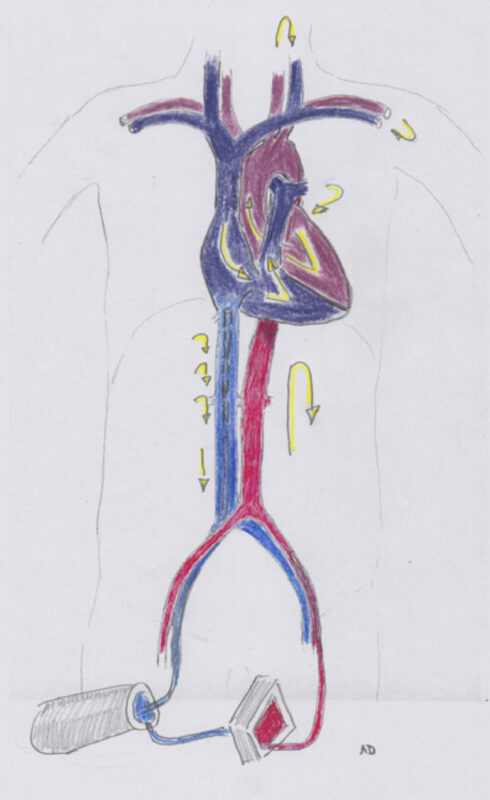 The concept of ‘dual circulation’ is visualised in the illustration below, which also shows how it can magnify the severity of differential hypoxia. The concept has been convincingly demonstrated in an animal model by Hou et al (2015). The reverse is true for the upper body circulation. Blood will return to the right atrium via the superior vena cava (SVC) and follow its natural path into the right ventricle. In the presence of pulmonary disease resulting in impaired gas exchange, this blood will remain poorly oxygenated and once ejected from the left ventricle will be distributed back to the upper body circulation. Further oxygen extraction results in markedly lower oxygen saturation in the SVC compared to the IVC. Q8. How do you manage this condition? Increasing the circuit flow need careful consideration. Initially, it may attenuate the problem however it does increase afterload and potentially contributes to ‘backwards’ LV failure, pulmonary oedema and worsening hypoxia. There is no uniform approach. This requires a case by case assessment guided by the experience of the treating physicians as well as institutional practice. The pros and cons of the above options will be discussed in subsequent posts.